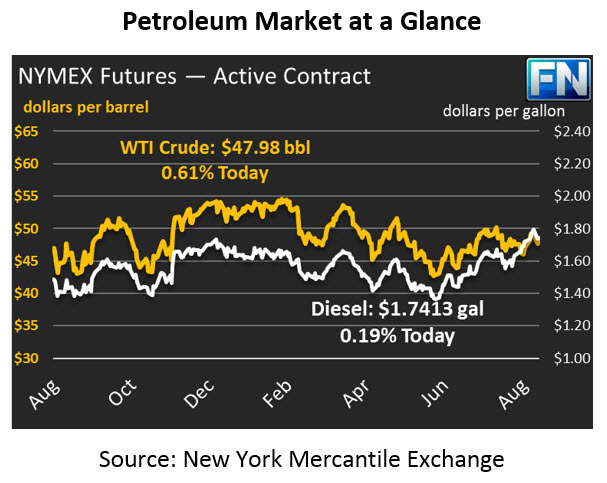 Crude prices are flat this morning, trading at $47.98 this morning, after gaining about 50 cents yesterday (~1%). At this point, just 4 refineries in Texas are still offline, representing around 690 thousand barrels per day (kbpd) of production. Several other refineries are operating at reduced rates. Diesel prices are also flat today, after shedding roughly 2.5 cents yesterday. Prices today are $1.7413. Diesel prices peaked last Friday at $1.7983, and have since had a long run down back to pre-storm levels. Gasoline prices are up 1.78 cents this morning to $1.6523. Before Harvey, prices were hovering between $1.55 and $1.65, so gasoline appears to be back in a more normal range. Of course, regional prices remain elevated in Texas, the Southeast, and Florida. OPEC released their Monthly Oil Market Report (MOMR) this morning, which shows that the organization’s production rates fell last month by 70 kbpd after rising for four months in a row. Of course, the decrease can be attributed to Libya’s 112 kbpd decrease in production while their largest oil oil field, Sharara, was offline. The field is now back online, which may lead to higher production numbers for September. The API will report inventory numbers later this afternoon. Goldman Sachs estimates that crude oil has built by 15.9 miillion barrels over the past week, while gasoline inventories have fallen by 7.8 million barrels and diesel has fallen 5.1 million barrels. It will be interesting to see if the API and EIA data support these figures.